Members may retire at age 65, with any amount of contributory service. Employees may retire at any time after age 55 with an actuarial reduction in their pension. Members with 35 years of contributory service may retire at any time regardless of their age. 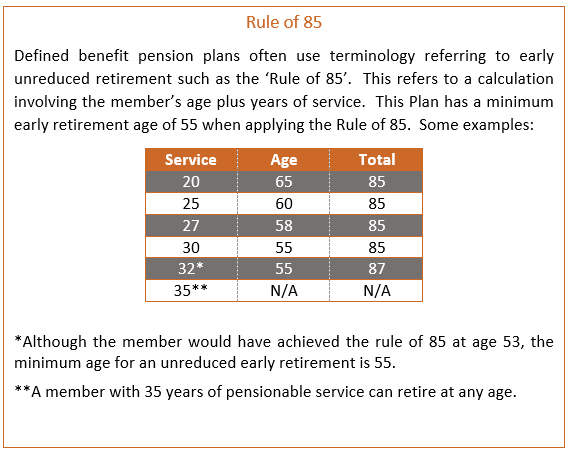 • The member’s age plus years of contributory service equals 85. The Regina Civic Employees' Superannuation & Benefit Plan is a defined benefit pension plan that provides eligible members with a retirement income based on a formula that takes into account the member's earning history and length of service in the Plan. The Plan represents employees from the City of Regina, the Regina Qu'Appelle Regional Health Authority, the Board of Education, the Regina Public Library, the Buffalo Pound Water Administration Board and the staff of Möbius.